Entertaining for a wine and cheese party? Having a gallery opening and want to keep food simple? The answer is pairing gourmet cheeses with varying accompaniments to create the perfect cheese plate to go with that glass of wine. Whether you're setting out a cheese platter at a big cocktail party, or composing a cheese course for an intimate dinner, there are a plethora of great cheese accompaniments to try. 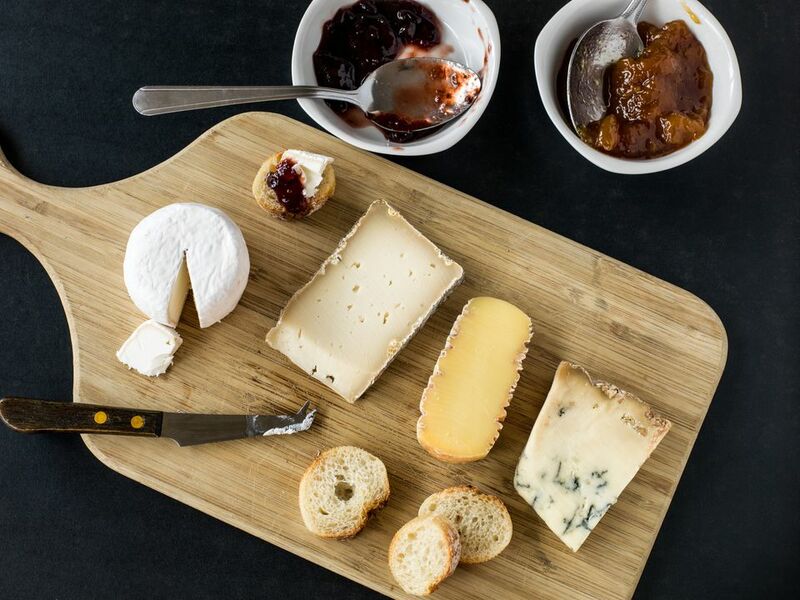 If you're serving artisan cheese, skip the mass-produced crackers, and seek out accompaniments that were created with equal care. You can entertainment crackers or gourmet crackers, as these go well with unique cheeses and look good too, but there are also more elegant choices. You'll do justice to both the cheese and everything you serve with it, and the overall taste experience will be so much more rewarding. And don't be shy about getting advice from your cheesemonger at a specialty store. Even if you're not sure you want to go that route, they are a resource that will help you make the best choice for what you looking for in terms of taste and visual presentation for your wine-and-cheese party. The goal of pairing gourmet cheeses with accompaniments is to offer up different tastes throughout the evening. That means anything too overpowering could spoil the palate. To avoid that go with simple accompaniments as the cheese is the star of the show. While there are seasoned crackers and crisps that will stand out, they should be served with cheeses with a milder taste and texture. Artisan cracker crisps, such as Raincoast Crisps can be served with dips or a tapenade, olives such as kalamata, niçoise, picholine, gaeta, alongside mild cheeses. Crusty breads such as baguette, rustic multigrain, and artisan rye such as Storye pair well with a richer cheese. Cheese straws go well on their own at a cocktail party or displayed among crudites with dips available for both. Dried fruits, particularly tart apricots, dates, tart Montmorency cherries: Stuff dates with cheese and wrap in prosciutto or other charcuterie & cured meats such as soppressata, speck, Serrano ham, and the like. Serve the cheese atop dried fruit for hors d'oeuvres. Add nuts like almonds, walnuts, pecans, hazelnuts and you've got the crunch, sweet and creaminess of cheese for a palate-pleaser for all. Fresh seasonal fruit goes well with cheese, but only if the flavors can balance out. Fruits like figs, grapes, peaches, and berries go with milk and creamy cheese. Save the hard and semi-hard cheeses for apples, melons, and pears. Dips and jellies are a mainstay at wine-and-cheese parties. Be sure to have chutney, mustard, fruit compotes and jams. You might also seek out quince paste, guava paste, and varietal honey.